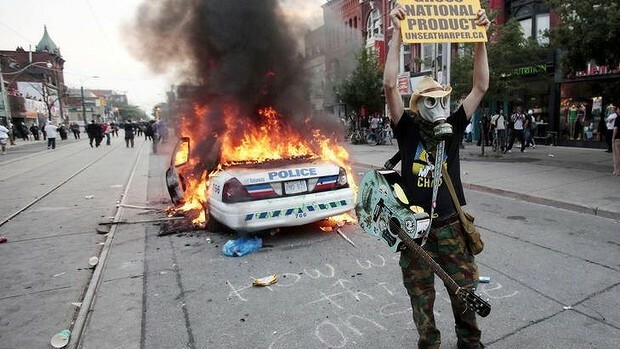 Protesters linked to the Black Bloc movement targeted the G20 summit in Toronto in 2010. The high-profile Black Bloc anarchist protest group is likely to be in Brisbane for November's G20 Leaders' Summit, a researcher into previous G20 summits in Toronto and London believes. Associate Professor Janet Ransley, who heads Griffith University's School of Criminology and Criminal Justice, believes the ease of travel makes it more likely that Black Bloc members - anarchist anti-capitalism protesters - could come to Australia for the Brisbane G20. "I think it would be naive to think that Black Bloc and some of those groups are not mobilising," Professor Ransley said. Professor Ransley said not all Black Bloc protest participants were "super violent".